As we mentioned earlier this week, there are 9 billion connected devices at present, and by 2020, that number is going to explode to 24 billion devices, according to new statistics released by GSMA, the global mobile industry trade group. 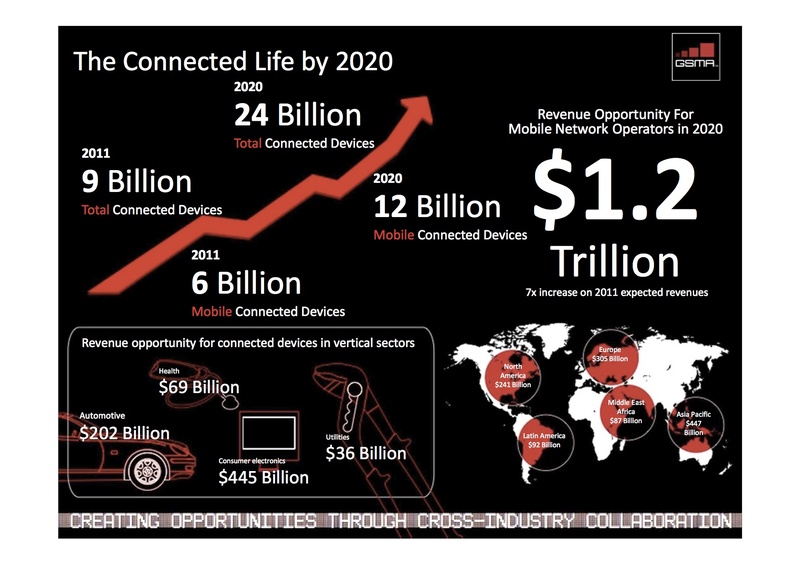 The total number of mobile connected devices will double from 6 billion today to 12 billion by 2020, GSMA says. This explosive growth will support an addressable revenue opportunity for mobile operators of nearly $1.2 trillion by 2020, a sevenfold increase from expected revenues in 2011. What does this Internet of things really mean? More connected televisions, cars, DVD players, photo frames and of course tablets and smartphones. This is a profound shift, and its implications are going to have an impact on every aspect of our society. We are going to be discussing the impact of this “connectedness” with the folks who are inventing this connected future — folks like Twitter’s Jack Dorsey — at our upcoming conference, RoadMap, scheduled to be held on Nov. 10 in San Francisco. What is the difference between Mobile and Total Connected? Does “Mobile” connected imply devices with 3G/4G connections and the “Total” implies WiFi, Bluetooth, etc.? Whats new for 2012 ?? We’re building the cloud services for internet connected video cams. Always on. Always monitoring. Always recording. I am a thing that has been interconnected for a while. The things that this thing (me) interacts with will now answer to other things and some of those things will be things like me. Also some of those things like me will have things that interact with my things. At some point some of these things controlled by multiple things will begin to control itself more than it is controlled by things. Things other than things like me will have motivations. But these things will not have desires. They are not that kind of thing. This revolution, as Om described it, fundamentally changes the way we live, work and play. As a part of Texas Instruments Wireless Connectivity Solutions business, I am not only excited to be one of the 20B conenctions but also to provide technology that enables developers to come up with the applications and use cases that haven’t even been thought of today. It will be an exciting ride! Internet of things is a new revolution of the Network. The objects become recognizable and acquire intelligence by connecting to the Net. Make a simple research on google, and you’ll find a plenty of embedded platform fot IoT. For my projects, I chose openpicus embedded platform. A standalone platform for embedded applications to interact via web, email or messages with simple sensors or complex electronic equipment. Assuming ISPs roll it out instead of sticking users behind NAT444 (multiple layers of NAT).